This article is about the secret area in Super Mario World. For other uses, see Special World (disambiguation). It has been requested that this article be rewritten and expanded to include more information about the enemy changes after the completion of the world. The Special Zone, also referred to as the Special World, is the ninth and final area in Super Mario World that can only be accessed by a secret Star Road in Star World. The levels are located in various environments and are designed to be much more difficult to clear than all the other levels in the game. The names of the levels are also peculiar for Super Mario World stage names; they are all based on '80s slang (including Tubular, Mondo, and Way Cool). If Mario and Luigi clear all the levels, a new Star Road will appear and transport the plumbers back to Yoshi's Island, more specifically Yoshi's House. However, upon returning, the season will change from Spring to Fall (changing the color scheme of the environment), and several enemies will be completely transformed. 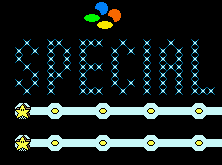 The symbol at the top of the Special Zone is the Super Famicom logo. It is also the logo used for the PAL version of the SNES, which retained the original Japanese console and controller pad design and colors. In the GBA version, the player can still see the SNES logo at the top left corner. When playing the GBA version, completing the Special Zone will not transform the overworld, since that will only happen if the player finds the 96 exits. A message stating that the player will receive a special present upon completing the Special Zone still appears in Super Mario Advance 2: Super Mario World, but this refers to when the Special Zone is completed in Super Mario Advance 2: Super Mario World, the Special levels will have records of the player's highest score in that level. The music on the map is simplistic, but if the player waits on the map for two minutes, a rendition of the overworld theme from Super Mario Bros. will start playing. The first part of the background music, coincidentally, was arranged as the Mystery Room theme for Super Mario Bros. Deluxe. In the Japanese version, there are only four stage names, with each being given to two consecutive stages. The names for all the courses in German all begin with ex-. ↑ Nintendo Mario Mania Player's Guide. Pages 156, 158-167. This page was last edited on April 5, 2019, at 20:55.